If you watch any of the red carpet shows that lead up to the major awards shows like the Golden Globes or the Oscars, you get to see the big stars... as well as a lot of Ryan Seacrest. Last time I checked though, the nominees for 'best sound editing' don't get pulled aside very often to be asked who they are wearing tonight (no offense to sound editors). 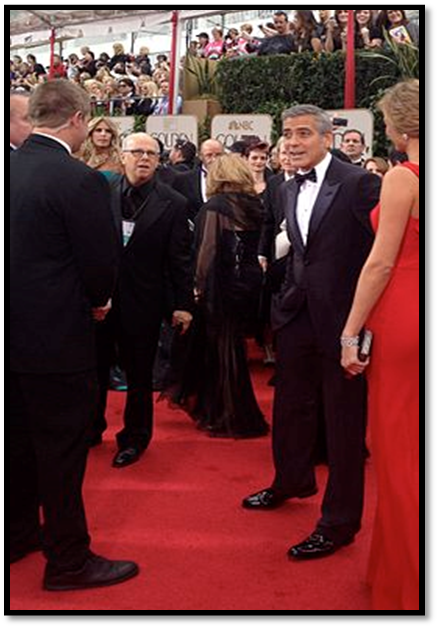 The viewers want to see the Scarlett Johanssons and the George Clooneys. Why? Well, they are more intriguing, more entertaining, more beautiful, of course! So as the assistant screenplay writers walk past in the background, the camera bulbs flash and the interviews focus on the A-listers. It should be the same with writing a story. Writers get to decide how much time to devote to each moment of their narratives, and it need not mirror the time those moments took to actually happen. Strong writers shine their spotlights on the most intriguing, most entertaining, the most beautiful moments of the stories they want to tell, and they whisk the unimportant and uninteresting moments along toward their respective seats at the back of the theater. Now it's not to say that the 'boring stuff' of a story doesn't serve a purpose. Often, less-important events and details are needed to transition or to anchor the story in its time or place. But picking out the best moments on which to focus can transform a story. 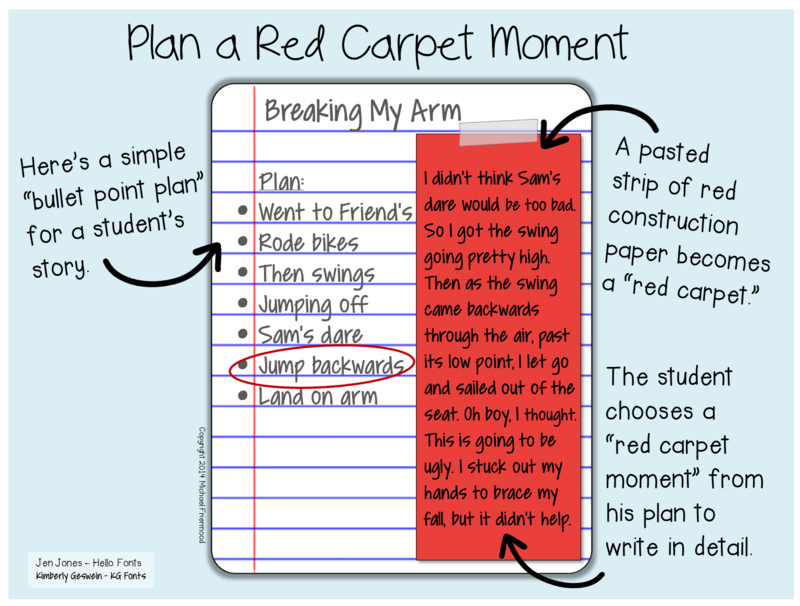 Help your students find their Red Carpet Moments within the stories they're writing. When conferring with a student, I like to simply ask, "What's the best moment in your story?" or "What are your favorite parts of this story idea?" to help students locate these moments. So what does a writer do with these moments? To answer that, just look at what Ryan Seacrest does with the big movie stars. He asks about every bit of their 'ensemble,' from the dress to the hair to the jewelry to the handbag to the shoes. No sequin is left unturned. But he also gets into their minds. "How are you feeling tonight? Tell me your thoughts on your movie?" And the viewers eat it up. Writers can give their readers the same things. Add the most detail to your best moments... What does it look like, sound like, feel like? What are the characters thinking and feeling? What exactly happens, piece by piece? Make those moments live up to their red-carpet worthiness.